Construction of log house for Finnish Fish Library started in early summer 2017 on the Kemiläisenvaara Hill in Muonio. New premises of library will be opened in 2018 by the Lake Jerisjärvi, that has been important historical fishing ground for local people. Fish Library will be an open library for researchers, collectors and others interested in fish and fishing. There will be also working space and accommodation in the building, so researchers can spent some time there and collect data for their studies and thesis. To begin with, the library will be open by appointment only. The special Fish Library Celebration Seminar was held yesterday 23.11.2017 in Muonio. 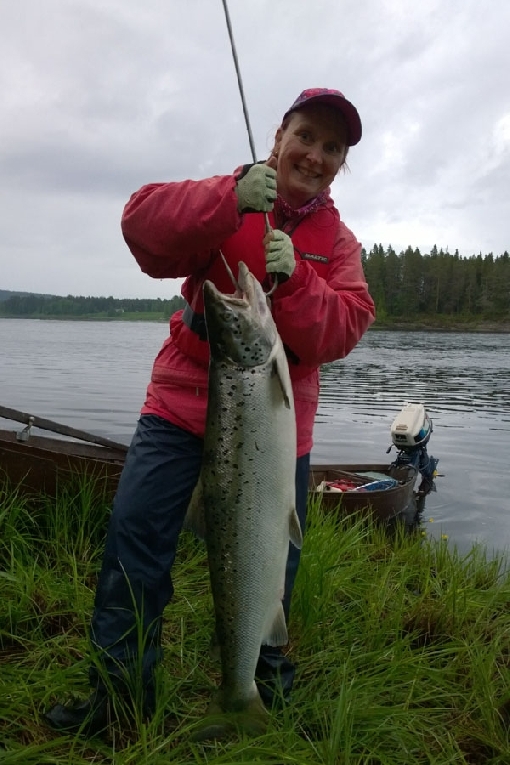 The event took place at the feet of the snowy Olos hill, located in Western Lapland just 6 kilometres east of River Muonio (Muonionjoki), a big tributary of River Tornio, which is famous for big salmon and grayling. Seminar ‒ which is part of Finnish Fish Library project and Finland 100 programme ‒ gathered big group of fisheries researchers, managers, officials and other enthusiasts connected with fishing from all over Finland. 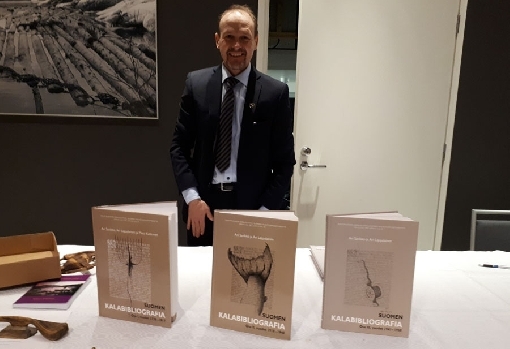 A brand new book, “100 remarkable fish books”, written by Ari Savikko ‒ the leader of Finnish Fish Library ‒ and Sulo Tiainen, was released at the unforgettable event. Salmon, the king of fish, was one of the main subjects of seminar. Research professor Jaakko Erkinaro from the Natural Resources Institute Finland (LUKE) presented the results of long-term monitoring of salmon stocks of northern Rivers Teno and Tornio and its importance for fisheries management. Science is a marathon, not just a sprint. To get reliable and useful data and information about fish stocks and impacts of different fisheries management actions, research must be systematic, comprehensive and constant. 10 kilos, one meter and silver flanks. River Tornionjoki is the most productive salmon river in the Baltic Sea area. Special researcher Jorma Piironen (LUKE) explained the present status of landlocked salmon on the water system of Vuoksi in Eastern Finland. There are finally some great news. The fishing for broodfish of critically endangered landlocked salmon has given especially good results in the fishing area downstream from Kuurna hydroelectric power plant. This autumn way over 200 broodfish was caught on River Pielisjoki, when normal catch in 21st century has been just some 50 fish per fall. Thanks to new fishing degree, bigger part of salmon stock has survived during the lake phase. In new degree landlocked salmon with an adipose fin is totally protected on Lake Saimaa and other waters on Vuoksi area. There is also a closed season during summer months in large area of Lake Saimaa. This success gives now good opportunities to support and preserve landlocked salmon in Finnish nature. The Finnish Fish Library books are accessible to the public via the website www.suomenkalakirjasto.fi. The library database has more than 22,000 books or writings. The collection holds nearly every fish book title published in Finland since 1730. Finland celebrates the centenary of its independence in 2017. Fishing has always ‒ since the end of the Ice Age ‒ been important part of Finnish way of life. Rescuing wide and important collection of Finnish literary works and establishment of Fish Library is one of the best presents nation can get.